Senior Lecturer, Botany Department, Tomsk State University. Demonstrator, Botany Department, Tomsk State University. Engineer, Laboratory of Biogeocoenology, Research Institute of Biology & Biophysics at Tomsk State University. Member of Editorial Board of The International Journal of Environmental Studies. Member of Academic Council of Tomsk State University. Member of International Association of Vegetation Science. Member of Russian Botanical Society. 1999-2000, co-coordinator, Swedish-Russian project "Dynamics of tundra border in Russia"
2006-2009, co-coordinator, TASIC SCM TUNING project SCM-T027B05 "Tuning educational programmes in Russian Higher Educational Institutes"
2007-current, coordinator, International Scientific Association "CAR-WET-SIB Biogeochemical cycle of carbon in wetlands of Western Siberia"
2014, Head, grant of the President of the Russian Federation for state support of leading scientific schools No. NSH-5946.2014.5 "Forest-bog landscapes of Western Siberia as an indicator and regulator of climate change on a global scale"
2015 , Knight of the Order of Academic Palms. Russian coordinator of the Russian-French Centre, grouping the CNRS, 20 French Universities, the SB RAS and 14 Siberian Universities, was created under the name of "French-Siberian Centre for Education and Research". This structure is mainly aimed at coordinating, developing and fostering all activities implied in linking the fundamental research with high education that plays a crucial role in the training of new generations of young scientists, and its priority direction "Environment and Ecology"
Russian coordinator of French-Russian D’UN GROUPEMENT DE RECHERCHE INTERNATIONAL (GDRI) «CAR WET SIB Biogeochemical cycle of carbon in wetlands of Western Siberia» net project. task coordinator in the INTAS 03-51-6294 “The effect of climate change on the pristine peatland ecosystems and (sub)actual carbon balance of the permafrost boundary zone in Sub­arctic Western Siberia” in a partnership with universities of Utrecht (Netherlands), Kuopio (Finland), Ural’skiy (Russia), Yugorskiy (Russia) and Institute of Soil Science and Agro-Chemistry SO RAS (Russia). Course administrator of Tempus-Tacis Compact Project "Dissemination of Training in Environmental management" with Universities of Oxford, Utrecht, financed by Tempus-Tacis (D-CP 25089-99). 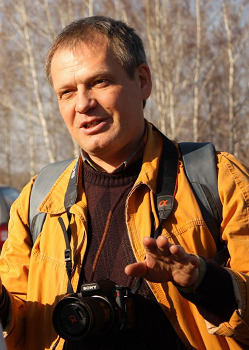 co-investigator of Swedish-Russian Project "The Dynamics of the Russian Tundra-Taiga Boundary", financed by The Royal Swedish Academy of Science. course co-ordinator of Tempus-Tacis Curriculum Development Project "Training in Environmental management" with Universities of Sheffield, Oxford and Utrecht, financed by Tempus-Tacis (T-JEP 10217-96). September 2016, UArctic Congress, St. Petersburg, Russia. 2016 TMU – TSU Joint Symposium, Tokyo Metropolitan University, Japan. December 2013 Toulouse (France) A workshop of the Siberian-French Center for Education and Research Siberia's role in current global change. September 2013, Abisko, (Sweden) Station Managers' Forum 6 was held at Abisko Scientic Research Station. Presentation “Aktru and Hanymei research stations”. September 2014, Krynica-Zdrój, Poland. Economic Forum. September 2006 “EU-Russia Higher Education Cooperation: Mobility of Students and Academic Staff, University of Helsinki, Finland. April 2000: Workshop "Dynamics of the Taiga-Tundra Interface", Abisko, Sweden. July-August 1998: 41st IAVS Symposium "Vegetation Science in retrospect and perspective", Uppsala, Sweden. Halicki W., Kochanska M.W. and Kirpotin S.N. 2016. Assessment of Biogenic Substances of Selected Terrestrial Waters in the Northern Part of Western Siberia: Significance for Ecology and Climate Change // Chapter 5. Siberia: Ecology, Diversity and Environmental Impact (Editors: Tabitha Robbins). Nova Publishers. New Iork. pp. 161-186. Callaghan, T.V., Johansson, M., Pchelintseva, Y., Kirpotin, S.N. 2015. Scientific cooperation throughout the arctic: The INTERACT experience (Book Chapter) // The New Arctic, Springer International Publishing: 269-289. Pokrovsky O. S., Shirokova L. S., Kirpotin S. N. 2014. Biogeochemistry of Thermokarst Lakes of Western Siberia. Biogeochemistry Research Trends. Nova Publishers. New Iork. 163 pp. Remote Study of Thermokarst Lakes Dynamics in West Siberian Permafrost (Yury Polishchuk, Sergey Kirpotin and Natalia Bryksina) pp.173-204 // Chapter 5: Permafrost: Distribution, Composition and Impacts on Infrastructure and Ecosystems. Nova Publishers. New Iork. Impact of Permafrost Thaw on the Biogeochemistry of the Thermokarst Lakes in Western Siberia: Current Status and Possible Future Changes (O.S. Pokrovsky, L.S. Shirokova, R.M. Manasypov, S.N. Kirpotin, S.P. Kulizhsky and S.N. Vorobiev) pp,236-262 // Chapter 7: Permafrost: Distribution, Composition and Impacts on Infrastructure and Ecosystems. Nova Publishers. New Iork. Kirpotin S.N., Naumov A .V., Vorobiov S.N., Mironycheva-Tokareva N.P., Kosych N.P., Lapshina E.D., Marquand J., Kulizhski S.P., Bleuten W. 2007. Western-Siberian Peatlands: Indicators of Climate Change and Their Role in Global Carbon Balance // Chapter 33 in Climate Change and Terrestrial Carbon Sequestration in Central Asia / edited by R.Lal, M.Suleimenov, B.A.Stewart, D.O.Hansen, and P.Doraiswamy, Taylor and Francis, Amsterdam, Holland, pp. 453-472. Kirpotin S.N. 2007. Landscape Ecology with the Fundamentals of Environmental Management. 2-nd edition. Tomsk, Tomsk State University Press, 262 (In Russian). Kirpotin S.N. 2005. Morphological-Geometrical Approach to Investigation of the Spatial Structure of Natural Bodies: from Organism up to Landscape. Tomsk: TSU Press. 248 pp. (in Russian). Kirpotin S.N. 2002. Landscape Ecology with the Fundamentals of Environmental Management. Tomsk: 180pp (In Russian). Kirpotin S., Zemtsov V., Revushkin A., Marquand J. 1998. International Course Curriculum for Masters Degree in Environmental Management. Tomsk. 37. (In Russian). Kirpotin S. 1998. Ecology of communities: the basic chapters. Tomsk State University, Tomsk, 61 (In Russian). Kirpotin S. 1997. The geometrical approach to study of spatial structure of natural bodies (symmetry and dissymmetry in alive nature). Tomsk State University, Tomsk, 114. (In Russian). International Masters Degree Programme on Environmental Management. 2001. Edited by S. Kirpotin, J. Marquand. Tomsk, TSU: 48 pp (In Russian). Alekseychik Pavel, Lappalainen Hanna K., Petäjä Tuukka, Zaitseva Nina, Heimann Martin, Laurila Tuomas, Lihavainen Heikki, Asmi Eija, Arshinov Mikhail, Shevchenko Vladimir, Makshtas Alexander, Dubtsov Sergey, Mikhailov Evgeny, Lapshina Elena, Kirpotin Sergey, Kurbatova Yulia, Ding Aijun, Guo Huadong, Park Sungbin, Lavric Joost V., Reum Friedemann, Panov Alexey, Prokushkin Anatoly, Kulmala Markku. 2016. GROUND-BASED STATION NETWORK IN ARCTIC AND SUBARCTIC EURASIA: AN OVERVIEW // Geography Environment Sustainability, 2 (09), 75-88. Rozhkova-Timina IO, Zemtsov VA, Vorobyev SN, Kolesnichenko LG, Loyko SV, Kirpotin SN. The relevance of the contemporary landscape-ecological and biogeochemical studies of the Ob floodplain (Актуальность современных ландшафтно-экологических и биогеохимических исследований поймы реки Обь). Вестн. Том. гос. ун-та. Биология. 2016. № 3 (35): 182-200. Manasypov R. M., Vorobyev S. N., Loiko S. V., Kritzkov I. V., Shirokova L. S., Shevchenko V. P., Kirpotin S. N., Kulizhsky S. P., Kolesnichenko L. G., Zemtzov V. A., Sinkinov V. V., and Pokrovsky O. S. 2015. Seasonal dynamics of organic carbon and metals in thermokarst lakes from the discontinuous permafrost zone of western Siberia // Biogeosciences, 12, 3009–3028, 2015. www.biogeosciences.net/12/3009/2015/, doi:10.5194/bg-12-3009-2015. Kirpotin Sergey N., Nemceva Galina G. 2015. Environmental, economic and social risks of nuclear power engineering (the case of the southern part of the Ob-river basin) // International Journal of Environmental Studies. Monograph: The great Ob-River basin, 72 (3), pp. 580-591. Kochanska, M., Halicki, W., Pokrovsky, O.S. & Kirpotin, S.N. 2015. Organic compounds in typical surface waters of the northern part of Western Siberia // International Journal of Environmental Studies. Monograph: The great Ob-River basin, 72 (3), pp. 547-556. Kashpur, V.V., Afanasieva, D.O., Negrul, S.V., Kirpotin, S.N. 2015. Public attitude to the development of nuclear power industry and ecological risks (the case of the Tomsk region) // International Journal of Environmental Studies. Monograph: The great Ob-River basin, 72 (3), pp. 592-598. Halicki W., Kochanska M., Pokrovsky O.S. & Kirpotin S.N. 2015. Assessment of physical properties and pH of selected surface waters in the northern part of Western Siberia // International Journal of Environmental Studies. Monograph: The great Ob-River basin, 72 (3), pp. 557-566. Ozheredov, Yuri I., Ozheredova, Alina Y. and Kirpotin, Sergey N. 2015. Selkup idols made of tree trunks and found on the Tym River // International Journal of Environmental Studies. Monograph: The great Ob-River basin, 72 (3), pp. 567-579. Vorobyev, S.N., Pokrovsky, O.S., Kirpotin, S.N., Kolesnichenko, L.G., Shirokova, L.S., Manasypov, R.M. 2015. Flood zone biogeochemistry of the Ob River middle course // Applied Geochemistry, Volume 63, pp. 133-145. Kirpotin S.N. 2014. Foreword: Western Siberia in a changing climate // International Journal of Environmental Studies. Monograph: Western Siberia in a Changing Climate. Volume 71, Number 5, pp. 591-595. Manasypov R.M., Pokrovsky O.S., Kirpotin S.N., Zinner N.S. 2014. Features of the elemental composition of plants of northern Western Siberian palsas // International Journal of Environmental Studies. Monograph: Western Siberia in a Changing Climate. Volume 71, Number 5, pp. 678-685. Pokrovsky O.S., Shirokova L.S., Manasypov R.M., Kirpotin S.N., Kulizhsky S.P., Kolesnichenko L.G., Loyko S.V., Vorobiev S.N. 2014. Thermokarst lakes of Western Siberia: a complex biogeochemical multidisciplinary approach // International Journal of Environmental Studies. Monograph: Western Siberia in a Changing Climate. Volume 71, Number 5, pp. 733-749.
International Journal of Environmental Studies. Monograph: Western Siberia in a Changing Climate. Volume 71, Number 5, pp. 768-774. Skrylnikova N.A., Lozhnikova A.V., Muravyov I.V., Kirpotin S.N., Oxheredov Y.I. 2014. Forecasting the local and global socio-economic impact of climate change in the Boreal and Arctic regions of Siberia // International Journal of Environmental Studies. Monograph: Western Siberia in a Changing Climate. Volume 71, Number 5, pp. 774-779. Shirokova L.S., Pokrovsky O.S., Kirpotin S.N., Desmukh C., Pokrovsky B.G., Audry S., Viers J. 2012. Biogeochemistry of organic carbon, CO2, CH4, and trace elements in thermokarst water bodies in discontinuous permafrost zones of Western Siberia. Biogeochemistry, pp. 1-21. doi: 10.1007/s10533-012-9790-4. Pokrovsky, O.S., Viers, J., Dupré, B., Chabaux, F., Gaillardet, J., Audry, S., Prokushkin, A.S., Shirokova, L.S., Kirpotin, S.N., Lapitsky, S.A., Shevchenko, V.P. 2012. Biogeochemistry of carbon, major and trace elements in watersheds of northern Eurasia drained to the Arctic Ocean: The change of fluxes, sources and mechanisms under the climate warming prospective. Comptes Rendus - Geoscience. 344, pp. 663–677. Pokrovsky O. S., Shirokova L. S., Kirpotin S. N., Kulizhsky S. P., and Vorobiev S. N. 2013. Impact of western Siberia heat wave 2012 on greenhouse gases and trace metal concentration in thaw lakes of discontinuous permafrost zone. Biogeosciences, 10, 5349–5365, www.biogeosciences.net/10/5349/2013/ doi:10.5194/bg-10-5349-2013. Manasypov R.M., Kirpotin S.N., Pokrovsky O.S., Shirokova L.S. 2012. Features of the elemental composition of lake water and macrophyte of thermokarst subarctic ecosystems of Western Siberia // Bulletin of the Tomsk State University (Biology). N 3 (19). Tomsk: Tomsk State University. pp. 186-198 (in Russian). Pokrovsky O.S., Shirokova L.S., Kirpotin S.N. 2012. Microbiological factors controlling the carbon cycle in thermokarst water bodies in Western Siberia // Bulletin of the Tomsk State University (Biology). N 3 (19). Tomsk: Tomsk State University. pp. 199-217 (in Russian). Kolmakova M.V., Zakharova E.A., Kuraev A.V., Zemtsov V.A., Kirpotin S.N. 2012. Temporal variability of climate and watering in Western Siberia according to data of meteorological stations, model reanalysis and satellite altimetry // Bulletin of the Tomsk State University. N 364. Tomsk: Tomsk State University. pp. 173-180 (in Russian). Milyaeva E.V., Mahatkov I.D., Ermoloff Y.V., Kirpotin S.N. 2012. Development of flooding along embankments in forest-tundra of Western Siberia // Bulletin of the Tomsk State University. N 365. Tomsk: Tomsk State University. pp. 207-211 (in Russian). Kirpotin S., Polishcuk Y., Bryksina N., Sugaipova A., Kouraev A., Zakharova E., Pokrovsky O., Shirokova L., Kolmakova M., Manassypov R. & Dupre B. 2011.West Siberian palsa peatlands: distribution, typology, cyclic development, present-day climate-driven changes, seasonal hydrology and impact on CO2 cycle // International Journal of Environmental Studies. Volume 68, Issue 5, pp. 1–20. Kirpotin S. 2010. Use of symmetry theory in studying the morphogenesis of life forms: the example of the cushion plants// International Journal of Environmental Studies. Volume 67, Issue 3, pp. 383-391. Volkova I.I., Volkov I.V., Kosykh N.P., Mironycheva-Tokareva N.P., Kirpotina L.V., Zemtsov V.A., Kolmakova M.V., Kouraev A.V., Zakharova E.A., Kirpotin S.N. 2010. High-Land Eshtykyol Lake-Mire System, Mountain Altai // Bulletin of Tomsk State University (Biology). N1(9). Tomsk: Tomsk State University, Pages 118-137. Kirpotin S. 2009. Foreword: Western Siberia special issue // International Journal of Environmental Studies. 1029-0400, Volume 66, Issue 4, Pages 403 – 404. Kirpotin S., Berezin A., Bazanov V., Polishchuk Y., Vorobiov S., Mironycheva-Tokoreva N., Kosykh N., Volkova I., Dupre B., Pokrovsky O., Kouraev A., Zakharova E., Shirokova L., Mognard N., Biancamaria S., Viers J., Kolmakova M. 2009. Western Siberia wetlands as indicator and regulator of climate change on the global scale // International Journal of Environmental Studies. 1029-0400, Volume 66, Issue 4, Pages 409 – 421. Kirpotin S., Polishchuk Yu., Bryksina N. 2009. Abrupt Changes of Thermokarst Lakes in Western Siberia: Impacts of Climatic Warming on Permafrost Melting // International Journal of Environmental Studies. 1029-0400, Volume 66, Issue 4, Pages 423 – 431. Shirokova L.S., Pokrovsky O.S., Kirpotin S.N., Dupré B. 2009. Heterotrophic bacterio-plankton in thawed lakes of northern part of Western Siberia controls the CO2 flux to the atmosphere // International Journal of Environmental Studies. 1029-0400, Volume 66, Issue 4, Pages 433 – 445. Mognard, N.M., Zemtsov V.A., Kirpotin S.N. 2009. The modern hydrological regime of the Northern Western Siberia from in situ and satellite observations // International Journal of Environmental Studies. 1029-0400, Volume 66, Issue 4, pp. 447 – 463. Kirpotin S., Polishchuk Yu., Zakharova E., Shirokova L., Pokrovsky O., Kolmakova M., Dupre B. 2008. One of Possible Mechanisms of Thermokarst Lakes Drainage in West-Siberian North // International Journal of Environmental Studies. Vol.65, No 5, October 2008, 631-635. Kirpotin S.N. 2005. Life Forms of Organisms as Patterns of Organisation and Spatial Ecological Factors. Journal of General Biology. Vol. 66. N 2. 239-250 (in Russian). Kirpotin S. N. 1999. The Challenge of Developing Innovative Teaching Methods in a Russian University. Teaching in Higher Education, Vol. 4, № 3. 415-417. Kirpotin S., Vorobjev S., Chmyz V., Guzynin T., Skoblikov S., Yakovlev A., 1995. Structure and dynamics of vegetative cover of palsas in Nadym-Pur interfluve of West Siberia plain. Botanical Journal, Vol. 80, 8: 29-39. (In Russian). Kirpotin S. 1994. Coenobiomorphs of the herbaceous layer in the taiga (West Siberia) pine (Pinus sibirica) forests. Botanical Journal, Vol. 79, 8: 86-92. (In Russian). Total list of publications consist of 170 references.